stpmj is named for Design Vanguard Award 2017 of Architectural Record. stpmj is featured in Architectural Record Design Vanguard issue, Dec. 2017. "Since 2000, Design Vanguard has showcased emerging architects from around the world. For this program, RECORD looks at firms established no more than 10 years ago that are demonstrating inventive approaches to shaping the built environment. Unlike some years past, when young architects were still coping with the economic downturn, this year’s winners have a robust body of built work and are making a big impact on the places where they practice." 에스티피엠제이가 미국의 건축전문지 ‘Architectural Record’가 선정하는 ‘차세대 세계 건축을 리드할 10인의 건축가상 (Design Vanguard Award)’을 수상하였습니다. 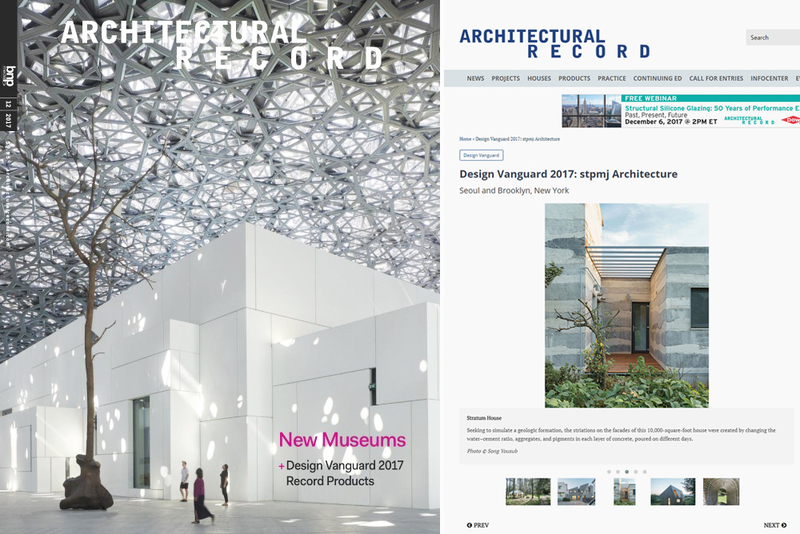 Architectural Record 2017년 12월호 Design Vanguard 섹션에 소개됩니다.